The central government in its commitment to curb the circulation of black money & widening of tax base has made quoting of Permanent Account Number (PAN) compulsory for 17 specified transactions..
To collect information of certain types of transactions from 3rd parties in a non-intrusive manner, the Income-tax Rules require quoting of PAN where the transactions exceed a specified limit. Persons who do not hold PAN are required to fill a form (Form 60) and furnish any one of the specified documents to establish their identity. Quoting of PAN will be required for transactions of an amount exceeding Rs.2 lakh regardless of the mode of payment. The changes to the Rules are effective from 1st January, 2016. The below changes in the rules are expected to be useful in widening the tax net by non-intrusive methods. They are also expected to help in curbing black money and move towards a cashless economy. Cash deposit exceeding Rs.50,000 in a day. Application to banking company / any other company/institution for credit card . Co-operative banks also to comply. Payment exceeding Rs.50,000 for purchase. Purchase/ sale of any goods (like Purchase of jewellery/bullion) or services exceeding Rs.2 lakh per transaction. Deposit with Post Office Savings Bank, Exceeding Rs.50,000 was Discontinued. Installation of telephone/ cellphone connections was also Discontinued. Where a person, entering into any transaction referred above 17, is a minor & who does not have any income chargeable to income-tax, he/she shall quote the permanent PAN of his father / mother / guardian, as the case may be, in the document pertaining to the said transaction. 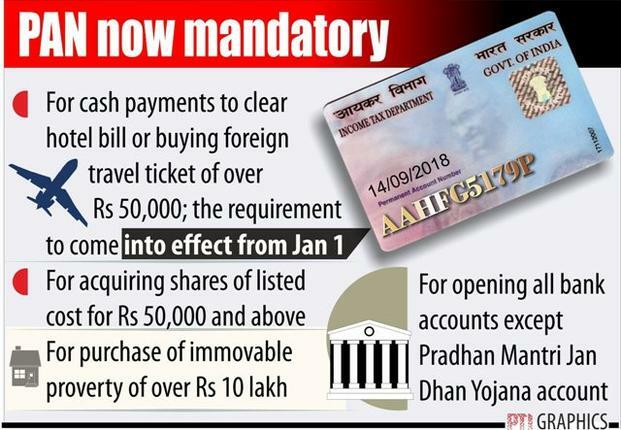 Further, where any person who does not have a PAN and who enters into any transaction specified above, he shall make a declaration in Form 60 giving therein the particulars of such transaction. Exceeding Rs.50,000/- on any one day.